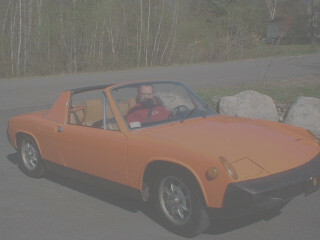 I had to buy this car, I test drove it just for fun and took it home to show my wife. How could I not buy it when she said, so are you gonna get it. I thought about it and said why not, it just counts as my 10 Year Anniversary, Fathers Day, Birthday and Christmas presents for the next 5 years. But that seems fair. I am overall very pleased with this car, however it is not perfect, and I didn't expect it to be. 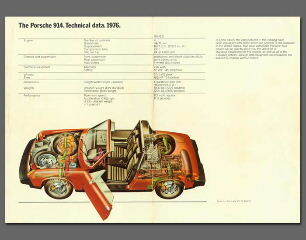 Mechanically it runs great, the 2.0 has a big bore kit and dual Weber 40 Carbs. 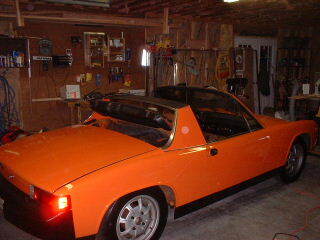 The body looks great as you can see, however under the battery box we have the typical 914 issue, RUST. 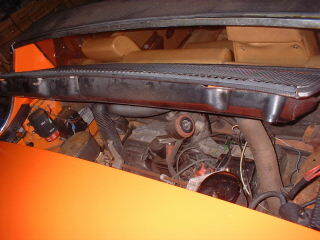 I have parts on order, Right inner rocker panel, Floor Pan Triange and 2 rocker panel triangles, so far. The car lifted 3 feet in the air in my garage. I haven't welded anything in 15 years so I need to get some scaps to practice on before torching my 914. Once I have cleaned everything and got all the parts that are hiding the damage removed, I will add some more pictures showing the before look. At the moment I am only planning to address those issues that must be addressed before driving the car, hopefully being able to run the car for the last half of July and into the fall. Then it will be time to Garage it again and lift it up and take care of all the rust on the bottom of the car, sounds like a winter project to me.